Word work is a valuable component of guided reading and aids in students' learning to read. Having students work on their level helps build upon the skills they have and develop a deeper understanding. 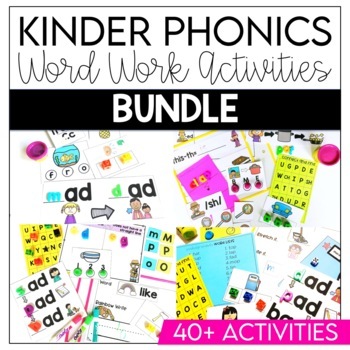 These activities are not tied to any book but are perfect for intervention time, literacy stations, and small groups. There are 40+ activities included. The sight words focused on in each level correlate to the sight words that are focused on in the Guided Reading leveled kits. You can find those HERE. Many schools are looking for a place to help jump-start their teachers as they are beginning a guided reading program. This is the perfect way to come alongside teachers and coach them through the process by providing easy to implement activities that focus on skills that are proven to promote success! For more guided reading help, visit Mrs. Richardson’s Class website!